Pretty gloomy of an image for your life I would say, but, early war stuff wasn't that impressive mostly - I mean there were no monstrosities like the hapless Tigers, or the scary Panthers and IS-2's. It had performance quite a bit less than the 45 mm anti-tank gun M1937 (53-K) on the BT-7, which at 300 meters did 60mm penetration (referring to my BT-7 development earlier). However, a 2 hit points is closer to light auto-guns and heavy MG's, so I think 3 is the minimum here. Armour was thin, at 17mm, hence no real defence dice should be there, and being a light tank, that was not that durable to being hit, I think 2 hit points justify that if hit, it will be likely to be taken out - armour class was similar to a Panzer II. It did have three crew-members, so that one is represented on the card. As to the high initiative, I thought, ambush requires being fast on the decision, since you are fighting on home ground (if you are ambushing, then it is assumed so I think) you know the movement of your enemy in advance. Please note, I made it that while the tank is in prepared positions, it has advantages, which are however lost if moved from - forcing the player to be more defensive in this case. 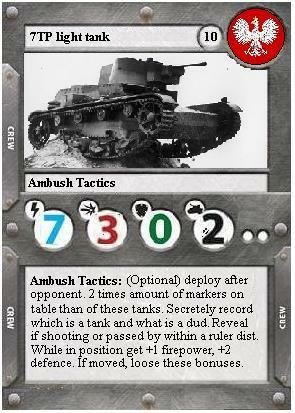 And yes, you do set twice the amount of possible position markers than of tanks with "Ambush Tactics" capability - leaves the opponent guessing where you are.... but this rule is optional, not all of these tanks must use it, those who don't, set up as normal. I was tempted to make it at 9 points, though that would mean that my CV-33 ranks better, which doesn't seem all to correct, especially if one takes into account the "Ambush Tactics" with the prepared positions. But, whatever people say here, if you think it is still a bit pricey, let me know. As always, subject to play-testing work and feedback based corrections, so awaiting comments here eagerly if you have them. That's all for now, hope to get more things rolling out soon. Next are some more Japanese Sushi and Sake flying your way , so watch this space. Some family stuff has me mostly just lurking for a few days, wanted to say cheers for another awesome job though! Stats look fair and I'm interested in playing with the Polish trait you came up with. Yep sounds fun , though don't quote me on the history stuff for that . When the Polish went into exile, the troops fighting on the British/American side used their doctrines and it is the same deal when they fought for the Soviets. But yeah, this would make for a fun game (alas not for those that are competitive, one thing is having a pathetic tankette horde doing this ambush against Panzer IV's, while it is another thing having Shermans, Cromwells and Churchills doing the same trick.... ). Anyway, I should have a Type 3 Chi-Nu rolling out soon, and thinking about the Finnish national doctrine card as well, reading up on the Motti tactics, sounds very fun. To be honest it inspires me - I would want to try to go to a local FoW 1000 point tournament with a 500-750 points Finnish army and learn how to use those great tactics upon destroying an enemy larger and better armed than you by divide and conquer (though it is an operational and not a tactical art, hard to replicate upon the table of Tanks, or FoW for that matter, so I would need to make provisions for that somehow, and still have it a fun and playable doctrine card to use). By the way, I have also started posting stuff on the Board Game Geek forum (don't have Facebook, so this my only way of posting to the wider community beyond this forum as well and letting know of our forum to others) for the tanks game (I am under the name of War_Dog there, link to the forum: https://boardgamegeek.com/boardgame/195242/tanks-panther-vs-sherman/forums/0 ). So if anyone of you are interested in posting more wider, feel free to jump in there as well. I did however promote our forum, saying that there are many more interesting stuff and that what I posted is just a snapshot of all the developments, so we will see. EDIT: Just to repeat again, I think anyone used these tactics, the Soviets did as well when retreating, that I know for a fact. I just put that down since unlike with the Japanese, I couldn't find official doctrine documents. So I am well aware that this is not really a thing that was only endemic to Polish troops. I think the same will be true for other early war nations, and documents will be hard to find. I am yet to look at Hungarians and Romanians and see what they used. Chinese doctrine might be an interesting study as well, which is on my to do list.